Whether you have a large living room or open concept floor plan, this sectional can make a statement in your home. Contemporary style is created from the clean lines, tapered feet, and squared arms. Timeless style with an updated look as well as plenty of seating for all to gather, this sectional is the perfect upholstered piece for your home. The Oslo Contemporary Sectional Sofa by Robin Bruce at Thornton Furniture in the Bowling Green, Alvaton, Glasgow, Scottsville, Franklin area. Product availability may vary. Contact us for the most current availability on this product. 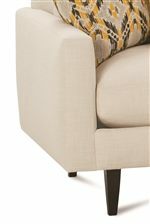 Oslo-118 Right-Seated 3-Seat End w/Corner 1 97" 37" 36"
Oslo-117 Left-Seated 3-Seat End 1 88" 37" 36"
Fabric Options Available in a variety of upholstery options. See store for details. Mid-century modern style is showed off in this living room collection. Create a place where you can show off your trendy style while providing comfortable seating. Create a living space where you love to spend time while also showing off your simple and modern look. The sofa can make a statement in your large living room while a chair provides additional seating and accent to your home. Choose a sectional when you want to add more seating or have a larger space to fill. The Oslo collection is a great option if you are looking for Contemporary furniture in the Bowling Green, Alvaton, Glasgow, Scottsville, Franklin area. Browse other items in the Oslo collection from Thornton Furniture in the Bowling Green, Alvaton, Glasgow, Scottsville, Franklin area.